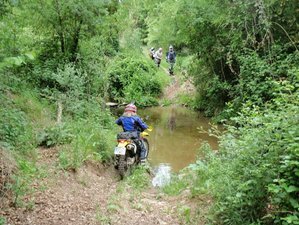 Motorcycle Enduro tour trans Catalonia is an off-road crossing of 4 days with departure and arrival in Barcelona of approximately 800 kilometers. You will travel in an adventure route through the mountains and roads of Catalonia including the Pyrenees. Although it is a journey without technical difficulty, it is necessary to have a minimum of experience in driving off-road. Every night, you will stay in a different hotel or country house for a well-deserved rest after a day enjoying the bike and the landscapes that you will see. If you do not have a motorcycle, you can rent it here. However, it is not possible to take a passenger on the motorcycle. Every night, you will stay in a different hotel or country house with a shared double room basis. Arrival at the hotel near Barcelona. You will start your journey of about 150 kilometers of off-road riding towards the north direction of Pyrenees. You head west towards Val D'Aran, about 160 kilometers with a lot of off-road. You go south to the town of Coll de Nargó, about 175 kilometers with the approximate half of off-road. You head back to Barcelona to the hotel. It is another 180 kilometers of off-road. The route may vary depending on the condition of the roads or the weather. This tour starts and ends in Barcelona, Spain. You will cross and see landscapes, several villages, and mountains of great beauty throughout Catalonia. You will be served breakfast and dinner every day during the tour. The meals are typical meals of each territory in Spain.